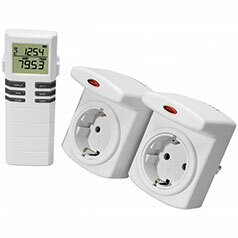 Conrad Energy Count 3000 and ELV Cost Control are wireles 230V electricity consumption measuring plugs Thomas Schulz has cracked the RF protocol of these device back in 2011 on the JeeLabs forum. The signals are FSK encoded and use the 868Mhz band. Thomas was able to receive them with a RFM12B module. Together with a JeeLink V3, it has found popular use with the German home automation software FEHM. In this post I describe how the RFM69 can take over a task that earlier had to be performed in software. One of the complications of the protocol is that the preamble of a series of 0x55 is scramble (whitened), and therefore more difficult to recognize. However, after scrambling it is still identical for all packets. This post details on the exact transmission protocol. There is no or hardly any spacing between the packages. When using the RFM01 or RFM12B, the preample and synchron word will not be in the received data. The preamble is intended to have the frequency synthesiser locked, while the synchron word serves as detection of the proper message. Open issue: How can an end-of-transmission be detected? Would VDI turn into zero? BBBBBBBB Station ID / rolling code: Changes with battery insertion. DDDDDDDD Humidity in %. Binary format 0-100. MSB (bit 7) unused. IIII Status bits: MSB b3=low batt indicator. The DCF code is transmitted five times with 48 second intervals between 3-6 minutes past a new hour. The sensor data transmission stops in the 59th minute. Then there are no transmissions for three minutes, apparently to be noise free to acquire the DCF77 signal. On similar OOK weather stations the DCF77 signal is only transmitted every two hours. The package format was deduced using a long transmision buffer on a JeeNode with some modificaitons in the RF12 driver. which inspired me to invest in HopeRF modules. After I was able to receive Alecto WS4000 or alike stations (two somewhere in the neighborhood, but not the one I aimed at) with a Raspberry Pi, and very noisy with an Arduino Nano, I decided to invest in JeeNodes. Now my “production receiver will be a Jeenode with on-board RFM12B, or added RFM01. To be decided. My experimatal platform is the Raspberry Pi, as I can code easily very sloppy, use large amounts of memory and do all kinds of checks while still being in time for the next pulse. The Nodo community is imho a bit difficult to access, as the major source of documentations is the c-code of a userplugin.